Spontaneously we had to find a team to interview Rapstar Kanye West in Vorarlberg, Bregenz. 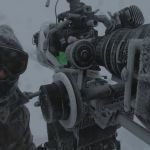 Carsten Darr, a colleague and good cameraman who lives in Vorarlberg could do it. he had spontaneously time and was two hours later in Bregenz to do the job. Shooting on location in Zermatt for Austrian Television Servus TV, on the famous Matterhorn – a dream comes true! For Planetwatch who organized the shoot in a great way, i was helping out as mountaineering audio man. 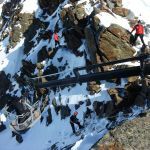 Was a great trip to the Matterhorn, where some days before the speedrecord of climbing the Northwall was done. Except of 2 peopel in the northface our crew were the only people on this usual quite crowded mountain. 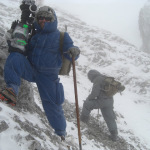 maybe the wintery conditions held other mountaineers down. 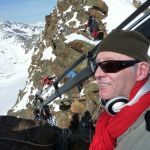 the Matterhorn was climbed for the first time 150 years ago and Servus TV will do an outstanding tv production to celebrate this strong action by Sir Whymper and his friends. Filming in a crevasse on 3000m, reenactment for a documentary about an 70 year old alpinist who fell into a crevasse in the Tyrolean alps and survived for 6 days. Prparing the crevasse for shooting was a challenge. 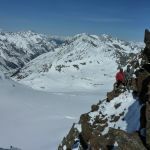 it was made possible by some mountainguides in close cooperation with the skiresort technicians. To film the hardest enduro ralley in the world requires navigation and enduro skills. Its great fun and really hard work at the same time. the carpathian forests and mountains are breathtaking. Romanian Landscape is amazing, people are friendly and have a lot of understanding for filmpeople! Shooting reenactments for a documentary about James Bond author Ian Fleming challenged us to scout for untracked powder with nice sunlight in a winter with quite poor snowconditions. 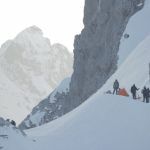 During Locationscouting with director and skiing DOP Jens Hoffmann we found ideal locations. Our oldschool Telemarkers showed great performace while acting hunting each other, like the Fleming brothers did in the thirties in Kitzbühel in Tirol, Austria. 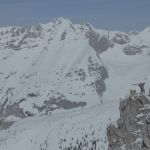 The Austrian Alps play a role then aswell, when007 Mr. James Bond learns to ski, he does that in Kitzbühel. 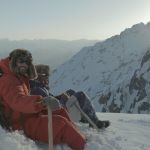 A movie with a lot of climbing in highalpine regions in the alps. . Italian RAI made it possible to realize this show together with director Robert Dornhelm.Walter Bonattis fight for the top which turns out to be one of the big mountain dramas in the history of Himalaya first ascents. 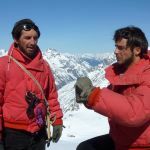 While Compagnoni and Lacedelli move the camp higher , Bonatti and pakistanian mountaineer Mehdi have to bivouc on 8100m without tents. 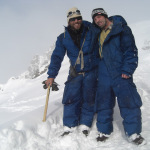 By leaving the oxygen bottles to the progressing team they made the ascent possible. 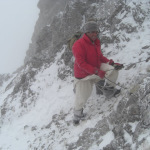 Bonatti turned out to become a mountaineer who soloed a lot. 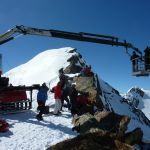 To realise a scene for a well known german tv series we had to make sure for alpine safety for the crew. The location scouting led to this somewhat challenging location in the middle of a forest with a scenic view to the lower alps. 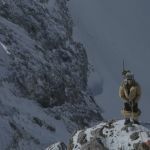 While a forestworker is trying to rescue a sea eagles baby he nearly falls off the cliff and gets rescued by a fearless climber, who is the “Förster” . 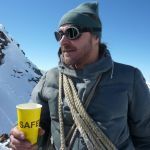 Alpine safety on set was key, as we were shooting with a crew of more than 40 people on top of a rockwall. Only precise preparation allows to shoot on extreme locations.